For a long time I have used Rode NT1a for nature recordings. It is a very good mic to capture the finest details in quiet soundscapes. But at the same time there is something missing in the sound quality, especially when it comes to low frequency and „audio depth“. I built a special shock mount for the LCT540s inside Rycote AE windshields (ORTF WS kit P/N:080210). That AE windshield is wider than normal WS windshield, especially made for stereo rigs so it is very good for large capsule, side address mics like LCT540s. Low handling noise is important for less rumbling wind noise and when it comes to LCT540, it is slightly better than NT1a. Everything was ready for a field test in late Mars so I followed the silence into the country side. I was lucky with the weather, dry and calm, maybe too calm because it makes the silence too quiet for this field test. Anyway sometimes light gust gently wipes the top of trees and bushes which sounds fantastic in the headphones, moving slowly from left to right. It was much easier to feel the depth of the field with LCT540 than it has been with NT1a. Nothing interesting was audible until in the early morning, about half hour before sunrise, when two Rock Ptarmigan started to „sing“. First in distance, but suddenly, maybe because of curiosity, they flied closer to the microphones and walked around the rig. The following recording is actually this moment. It was recorded in IRT cross, which gives lot of opportunities in mixing. It gives me four different stereo recording in to four directions, all in NOS, plus many other versions too with different channel mix. It can be useful when looking into specific soundscape. It is for example possible to avoid traffic noise or other unexpected sounds from one or another direction. This is two versions of the same recording where I mix four channels differently into stereo. Counting channels 1-2-3-4 clockwise to L-R-Ls-Rs and the second one L-R-Rs-Ls (which is usually normal IRT setup). This is a „high dynamic“ recording of silence, so I don´t recommend it played loud. It might destroy some speakers (ears too) if it is played too loud without attention. Good monitor headphones are recommended or quality open headphones while listening at low to medium level. It is difficult to compare LCT540 and NT1a in details. I am not sure which one is better for silence recordings. Both have same specification of lowest self noise on the market, they have their own characteristics and after my NT1a mod, they seems to have slightly different polar pattern. The outcome is shown on the spectrograms on recording A and recording B. The LCT540 is above. NT1a below. NT1a is extremely well focused in the mid-range 500hz – 5Khz. which is exactly the frequency where most common birds sing. So NT1a is very good for nature recordings. But sometimes NT1a sounds „flat“ because NT1a is rather poor on low frequency, sometimes like out of phase (which could be as well caused of wrong setup). I have not a long experience recording with LCT540s, but at the moment the overall sound quality seems to be better than NT1a, especially in lower frequencies which give better „juicy“ sound and „depth feeling“. But at the same time it is not as „clear“ as NT1a in the mid range. How do they withstand humidity or handling noise in windscreen? I can only say this. Both need DIY shock mount if they should be fit in Rycote windshield. Both are sensitive for handling noise especially NT1a. High humidity is usually not a problem for microphones in Iceland, but there are stories about problem with NT1a in other countries. I will update this information/comparison as soon as I have got more experience with LCT540s. You can also search for NT1a and LCT540s on this website and listen to nature recordings. Listening with quality headphones will give best result. When I use boom in recording I have used Audio Technica BP4025 stereo mic in Rycote windshield. It is not too heavy and it gives me stereo recordings. But very often I have been disappointed with the „musical“ sound quality, so I don´t often get quality ambiance recordings with this setup. Saying that, it does not mean BP4025 is a bad mic. BP4025 has a very low noise floor. It is the perfect mic for special circumstances like where size does matter and for very quiet environment/nature recordings. DPA4060 is a pretty sounding miniature mic, sold in pairs and much lighter than any original stereo mic on the market. That means it is perfect to use for boom recordings. But because DPA4060 is an omni mic it is necessary to separate the capsules to get stereo. It is done in two ways. Separate the capsules with space (around 40cm) to get time difference, or place them in two sides of some sonic baffle materials. The BP4025 was in a short Rycote WS2 windshield which has overall length (wide) 34cm. So it was important to place the capsules each side of some baffle material to get acceptable wide stereo. I end up with a simple „binaural“ project I made out of wooden leftover (see pictures). I decided not to use silicon artificial human ears because the ears will change the frequency curve at 2,5Khz and 5,5Khz, which means I needed to fix the EQ afterwards on all recordings made with this rig. The result was stunning. The rig I made was lighter and better wight balanced than previous BP4025 setup. The overall wight is only 750gr (mics+wood baffle+WS2 basked+fur). It also gives me wider „stereo image“. But best of all, it withstands wind- and handling noise much better than previous BP4025 setup. Following recordings are 4 and were made in three locations. The two first one are waves on seashore, then one from a cliff, 300 m above sea level with seabirds and the last one is from a football game in Reykjavik. All where recorded on Sound devices 744. All recordings are straight from the recorder. Just cut and paste, fade in and out and then down grade from WAV to mp3. The two first recordings are big and then small waves. The mic have fur, HPF is off and gain at 45db. 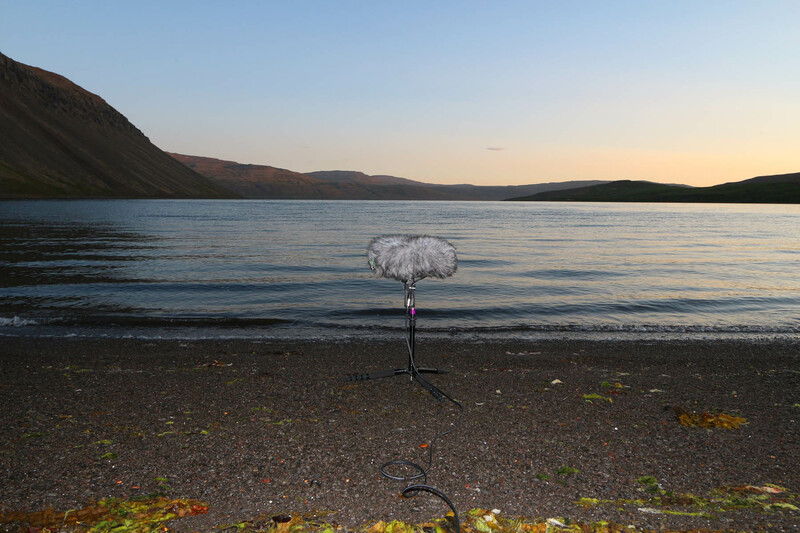 The mics are faced from the beach to the fjords. You will hear car pass by „behind“ the mic. Notice, you will hear a short „drop out“ when it pass. It is because it passes my car which was located on the road side. See location. In the cliff recording the mic is without fur. 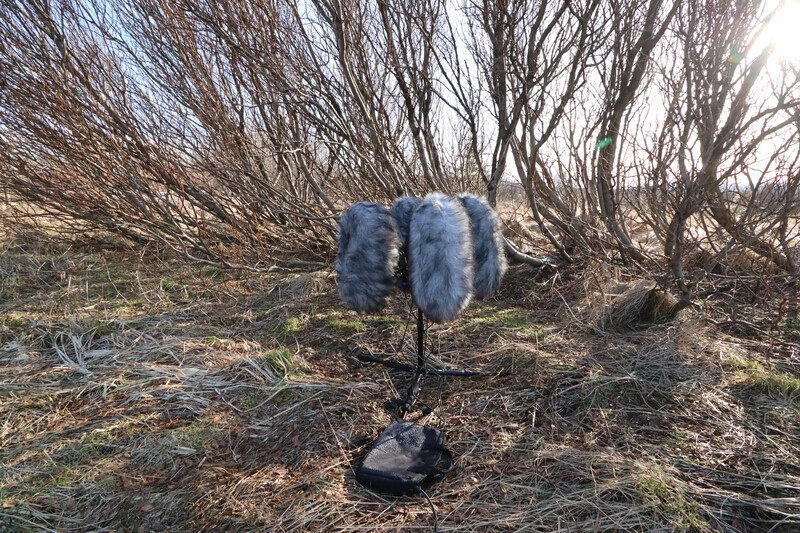 It is possible to hear how strong gust sounds on the Rycote basket, but that is anyway much better (or different) than the my previous BP4025 setup. HPF at 40Hz and gain at 45dB. The boom with the mic reaches the cliff edge about one meter. See location. The last recording is from a football game celebration in downtown Reykjavik. No fur, HPF at 40Hz and gain at 40dB. The mic stood on a boom about 1 meter above the crowds head. See location. The summer 1978 I got a job at Sogsvirkjanir power stations, about 50 km east of Reykjavik capital. 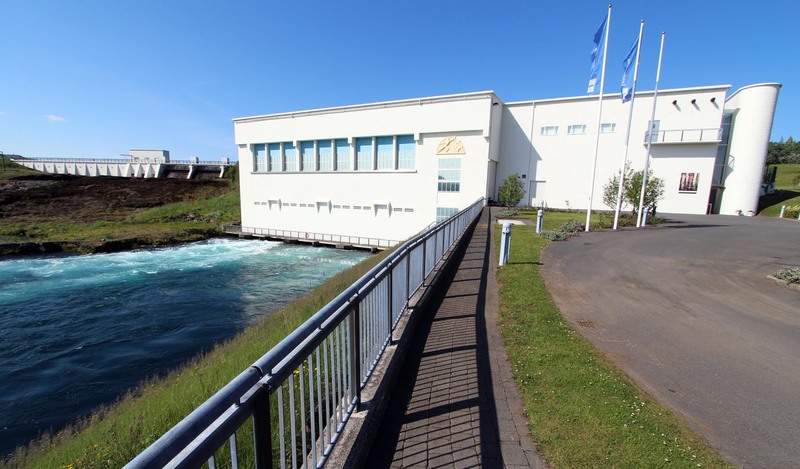 There are three power stations close to each other in the river Sog south of Þingvallavatn lake. This place was familiar to me because my grandparents lived at a nearby farm, Efri Brú. For me, as a tanager, this summer was very important. It was the time to decide what I would like to do for a living; a technician, farmer, engineer, or something else. I was not sure. My job at Sogsvirkjanir was miscellaneous, gardening, cleaning and painting. But what interested me most was working in the power stations when generators were shut down for cleaning and overhauling. As a thin, lithe teenager I was used to go into and work inside places in the generators where older, fatter and stiffer engineers could not access or work. Afterwards I think it was very damaging environment for my health. Working almost every day with 1,1,1Trichloroethane and other toxic liquids with useless mask. But in these days nobody took care of it, and I did not take care of it either. All this machineries fascinated me so I decided to start learning electrician in the autumn 1978. The following recording is a combination of five recordings I made in and around Ljósafoss power station the summer 2013. This is the oldest power station in the river and was built on my grandfather’s land 1934. The birdsong in the recording is from a nearby county at Laugarvatn which is my grandmothers’ birthplace. It reminds me of my childhood at my grandparent’s farm, especially in the swamp behind the cowshed, so it is worth to keep it with this recording. Even though all these sounds gives me some nice memories, they sound also far in my mind. It feels like a memory from my “last life”, not something that happened in my life about 40 years ago. Every thing has changed fast in this county. My grandparents are long gone and almost all farming in the county too. Land in many places has been broken up in peaces for cottages. Farming and animals have disappeared. Instead of narrow gravel roads, all roads now have asphalt. Fast driving, noisy traffic, day and night seems to be the only human activity. The following recording gives you a flight as a ghost, or a spirit from my grandparents farm to Ljósafoss power station. Your flight goes above and through water, concrete and steel. It starts over the reservoir, then trough the intake, penstock, power house, transformer and to the outflow canal. The flight ends as it starts with “quiet bird song” far away from the nosy power station. Sumarið 1978 fékk ég sumarvinnu við Sogsvirkjanir. Þetta sumar varð mér heldur örlagaríkt, en þá tók ég ákvörðun um að læra rafvirjun. Eftirarandi hljóðmynd var tekin upp sumarið 2013 í og við Ljósafossstöð. Segja má að það sé í raun minningabrot frá sumrinu 1978 og þremur næstu sumrum á meðan ég vann þar við ýmis störf. About 30km east of Reykjavik capitol is Hellisheiðarvirkjun a geothermal power station. This power station uses energy from drilled wells in the surrounding area. In the drilling process it is necessary to let the wells “breath” or “blow” for a while. When it happens it is extremely noisy when the energy is wasted into the atmosphere, mostly as a hot steam in mixture with toxic gas like carbon dioxide (CO2), hydrogen sulfide (H2S) and also substantial quantities of hydrogen (H2). Other gases such as nitrogen (N2), methane (CH4) and argon (Ar) are in the gas mixture, but in lesser extent. The rumbling noise from blowing wells is so loud that it can be easily heard in far distances (up to 20-30km, depends of condition). It was easily audible when I was on my way east of Reykjavik on a cycle trip last summer. I was cycling Nesjavallavegur (road) when I decided to record this noise. The power station was in about 10 km distance, but the blowing wells were somewhere between in 10-15km distance, probably behind the mountain Hengill. 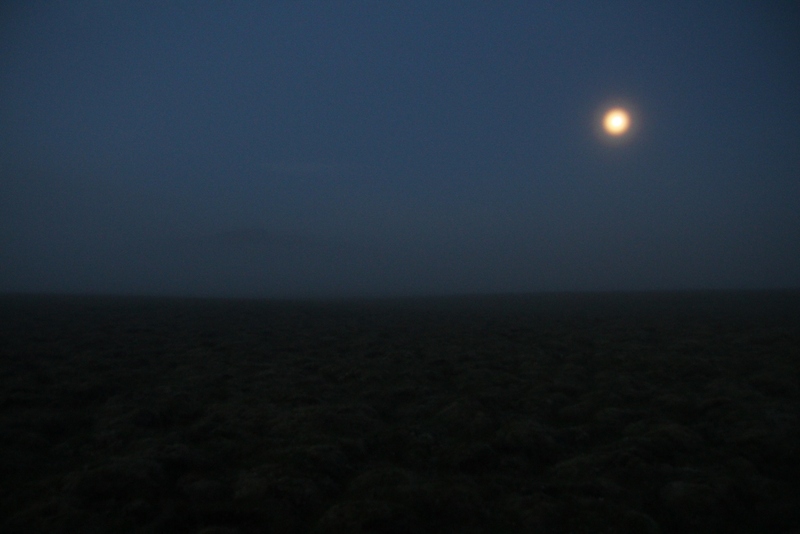 This recording was made at 3am, 24th of July 2013 at Mosfellsheiði. The weather was calm, but cold, very humid and fogy. Keep in mind, this is a “quiet nature recording” so you should not play it loud. On the field the birdsong was barely audible. Hér er á ferðinni upptaka frá því 24. júlí 2013, þegar ég fór í stutt helgarferðalag austur fyrir Fjall. Þegar ég lagði af stað var vel liðið á kvöld og skollin á blaut og köld þoka. Þegar á Nesjavallaveginn var komið varð ég var við miklar drunur ofan af Hellisheiði en þar blés borhola út orku og eiturgasi engum til gagns. Drunurnar virtust fylla loftið fremur en að koma úr tiltekinni átt svo ímyndunaraflið fékk að blómstra. Það var ekki laust við að maður léti hugann reika, því þar sem maður átti að venjast þögn á þessum tíma sólahringsins voru nú þungar drunur allt um liggjandi sem hér um bil kaffærðu söng sumarfuglanna. Nálægð við helvíti eða heimsendi var manni efst í huga þar sem maður sniglaðist einsamall eftir veginum fremur kaldur og blautur í dimmri þokunni. Rétt eftir að hæstu hæð Mosfellsheiðar var náð ákvað ég að staldra við og taka upp þetta sérkennilega andrúmsloft sem þarna ríkti þessa júlínótt. 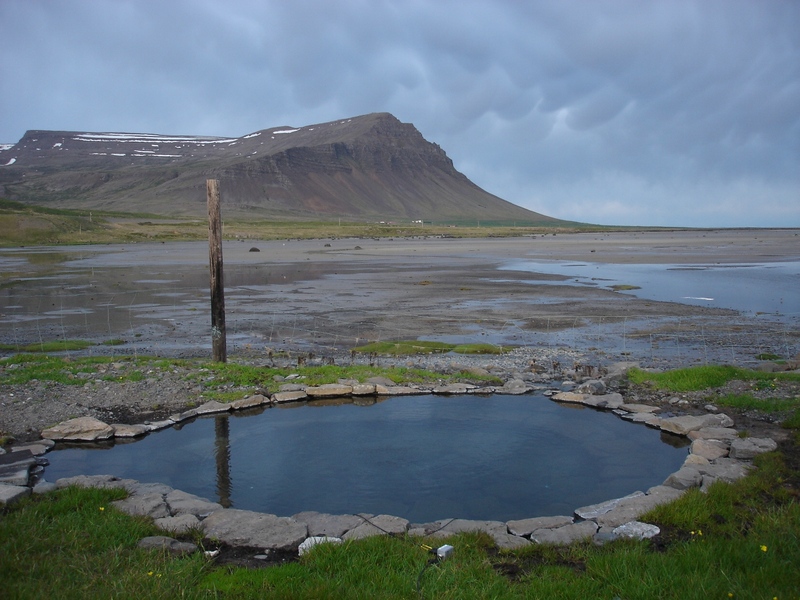 In Iceland it is possible to find many hot springs all over the country. Many of them have optimal temperature for bath and to relax. For centurys people have piled stones and turf around some of this known natural hot springs. In the beginning of last centuries many of this natural hot springs were used to teach people to swim. Soon, many communities all over the country built real swimming pools of concrete near these springs. One of these places can be found at Krossholt at Barðastönd, Southwest Iceland. There is Krosslaug, a 12 meters long swiming pool, built in 1948. There is also newly built natural hot tub, build on a hot spring in traditional style. It was the Youth Association of Barðaströnd County who piled this tub with stones, gravel and turf. From the bottom through the ground of the tub comes the warm water with bobbles that gives relaxing sound while laying there with the ear below the surface. You can hear the bobbles moving upwards trough the gravel deep from the ground under the tub. This recording was made with hydrophones at 15th of June 2012. Another interesting recording from Krossholt, nearby place is: Opus for power line, bass, wind and birds. Krosslaug í Mórudal við Barðastönd. Á Birkimel við mynni Mórudals, hefur myndast þjónustukjarni Barðastrandar. Það hefur reynst mér ótrúlega erfitt að afla sögulegra heimilda um þennan stað á vefnum. Því segi ég aðeins það litla sem ég tel mig muna. Á sjöunda til níunda ártaugar síðustu aldar var þar skóli, félagsheimili, kaupfélagsútibúð og litilsháttar iðnaður. Þar var einnig reynt að koma upp fiskeldi. Það fór á hausinn. Í dag er staðurinn líklega betur þekktur fyrir ferðaþjónustu. Stéttarfélög eru þar með orlofshús sem og ferðaþjóunsta sem rekin er frá nærliggjandi bæ. Víða í Mórudal er að finna volgar uppsprettur. Sundlaug var reist við eina slíka í fjörunni neðan við Krossholt 1948. Hefur hún átt það til að fara nokkuð illa í vondum veðrum. Vorið 2011 var laugin tekin í gegn og var þá hlaðinn heitur pottur að ég held yfir volgri uppsprettu fremur en borholu..
Það er ákaflega notalegt liggja í þessum potti í makindum með eyrun undir yfirborðinu og hlusta á volgt vatnið og loftbólur streyma upp úr jarðlögum pottsins. Meðfylgjandi upptaka var gerð í pottaferð 15. júní 2012. Önnur áhugaverð upptaka sem gerð var við Krossholt er: Tónverk fyrir háspennustrengi, bassa, vind og fugla. 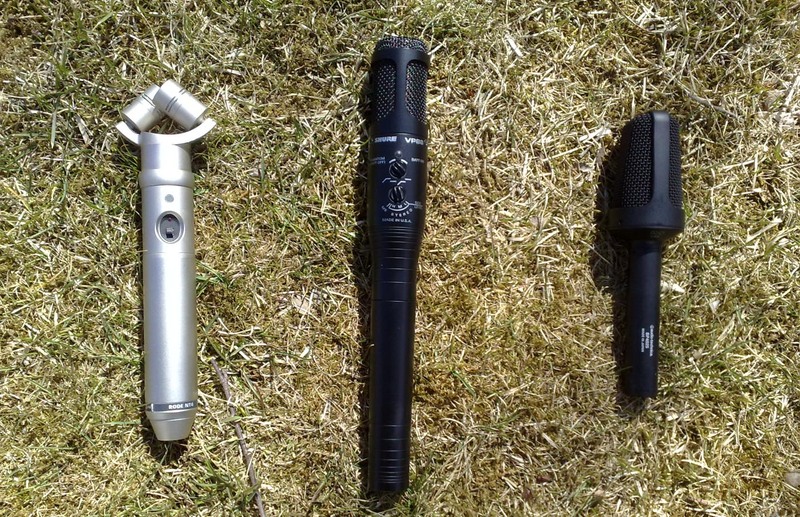 Three stereo microphones noise and sensitivity comparison. This recordings include a spoken word from pocket radio at very low volume and ticking alarm clock in 1,6m distance. The volume settings on the radio was so low, the sound was hardly audible with bare ears. Noise from radiator pipeline is audible in the background. Miscellaneous bird life is outside and should be also clearly audible. Keep in mind. This test is only noise and sensitivity comparison. High sensitivity and low noise is VERY important for nature recordings. 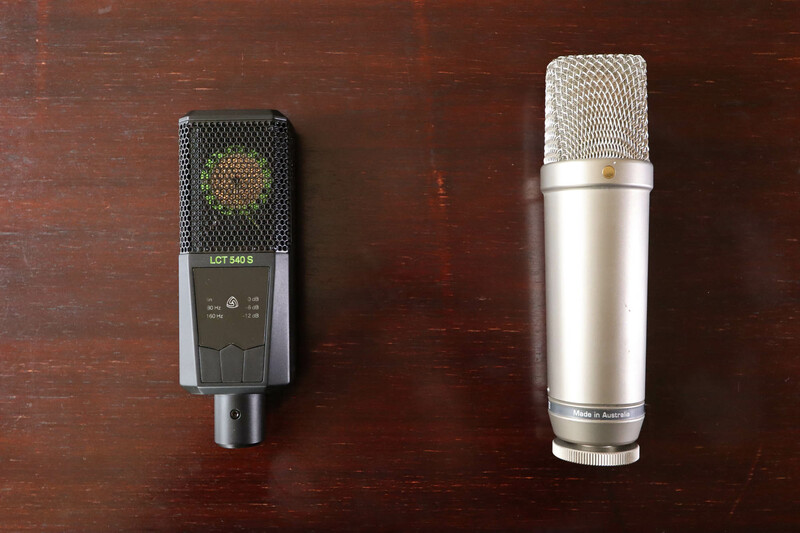 This comparison does not give any information how this microphones sounds for music recording or how they withstand high pressure sound level. Quality headphones recommended while listen. Shure VP88, Rode NT4 and Audio Technica BP4025 direct from recorder. All at same gain level at 55dB. All three recordings are now independently level normalized up to 0dB.